Do you organize banquets as a professional? Does your entire family love Sunday's gatherings at your place? Or maybe you just need to conveniently move dozens of foldable chairs to a different floor or building. Whatever the case may be, this wheeled steel cart is exactly what you need! Keep reading! Introducing The Ultimate Solution For Toting, Storing & Moving Foldable Chairs: AdirOffice's Two Tier Folding Chair Cart! Durable steel construction for up to 84 folding chairs load. Save time with easy and convenient chair transportation, guaranteed by the four thermoplastic rubber swivel caster wheels whether the caddy is moving fully loaded or unloaded. With this portable and durable rack you will be able to set up the necessary seats with no fuss, no delay and most importantly, no sweat. Organize Your Foldable Chairs Like A Pro! DURABLE CONSTRUCTION MADE OF STAINLESS STEEL: The AdirOffice folding chair carrier is designed to store chairs on both sides, with a weight carrying capability of up to 1000 lbs and a powder-coated steel cart body, resting on four 4" thermo-plastic rubber locking wheels, in order to ensure a long lasting and useful provided trolley. DESIGNED TO CARRY WEIGHT SECURELY: AddirOffice's heavy-duty trolley allows for a seamless deployment of up to 84 folding chairs and is constructed to universally accommodate most plastic and metal folding seats. The slightly angled arms provide a secure chair fit, minimizing movement damages and protecting content from sliding while in transit. 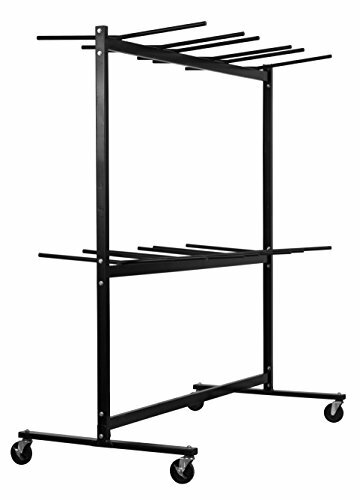 ORGANIZE MORE WITH LESS EFFORT: This wheeled hanging truck is a must have equipment for Hotel owners, Banquet Halls or Conference Centers. A practical solution, as its unique design offers convenience and flexibility, perfect for a fast set up and break down of the requested scene, with zero physical strain. RISK FREE PURCHASE WITHOUT HESITATIONS: You can order the AdirOffice durable chair cart now and if for any reason you are not satisfied with your purchase, you are covered with a limited lifetime warranty, assuming normal use.